If you have not been to Salem, MA I highly recommend it!! I mention it today because of course its Halloween and Salem is extra special today, but going to Salem and learning about the Salem Witch Trials is just as cool any other day of the year. Back in high school, in order to graduate, every senior had to do a year long research project on a topic of our choice. We had to log research hours, consult an expert on the subject, write a very long paper, and then present our findings to a panel for a pass/fail. Basically my future was based on this one project, and if I failed I would be sent back to re-do everything (of course I passed though). My topic of interest was the Salem Witch Trials! So for one year I immersed myself in the happenings of Salem, MA around 1692. I have to say, it was the most interesting topic I studied all 4 years of high school (but of course I am biased). 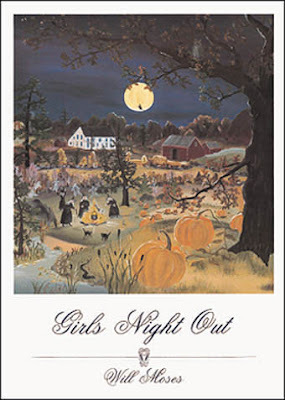 During my many trips to Salem I picked up this "Girls Night Out" poster. I had it framed and to this day it hangs in my old bedroom- I love it! 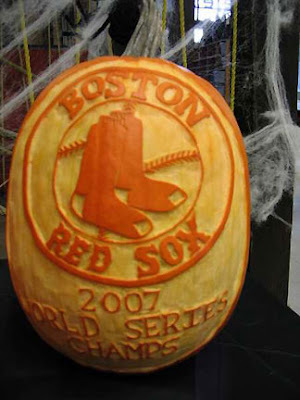 Back to 21st century Halloween...this has to be my favorite pumpkin I've seen! 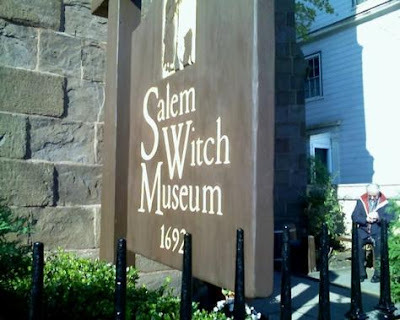 Oh I've always wanted to go to Salem. How fun that you got to pick your own topic. We had something similiar in our HS and senior year we had to do an exploration project with the topic of our choice. I made my own magazine. "What is Spina Bifida and how to prevent it". It was torture.. I remember your project and it was of course fabulous!